Striking teachers and school service workers from Poca brave a threatening sky and rain Thursday afternoon in front of Poca Middle School during the sixth day of the statewide teachers strike. 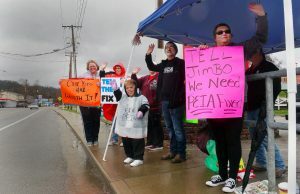 CHARLESTON, W.Va. — On Thursday, one week into the statewide public school employee strike, which will continue Friday with public schools in all 55 counties closed, the West Virginia Senate pumped the brakes on a bill that would give teachers, school service personnel and the State Police a 5 percent raise. Instead, Senate President Mitch Carmichael, R-Jackson, sent the legislation (House Bill 4145) to the Senate Finance Committee to change it and create a long-term revenue source for Public Employees Insurance Agency health coverage. State school employee union leaders suggested Tuesday evening, when the 5 percent raise for school employees was proposed by Gov. Jim Justice, that workers return to schools Thursday. But with the strike now continuing two days beyond what the state union heads called for, it isn’t clear what effect the proposed alternative will have on ending the strike, and it isn’t clear if any end to the strike will be unified statewide.